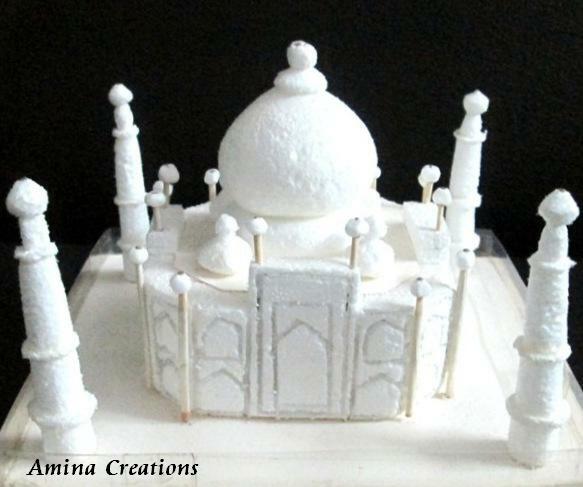 This is the miniature model of Taj Mahal that i made recently. You too can make one. The Taj Mahal enclosed in the case is 7"x7"x5" in size. I made this with thermocol and carved the various pillars and domes using sand paper.By referring the photographs of Taj Mahal, I first drew the basic outline, then the outline of the forms of the pillars and domes on paper. Then deciding on the proportions, i proceeded to make the various parts. Each part in the pillar has been made separately and then glued together using fevicol. For the smaller pillars i rolled paper strips and glued them in place. Once all the parts were glued and ready, i placed them in a flat square piece of thermocol of 7"x7" size. I also carved the finer details like doors and windows using a pencil. Then using OHP sheets i made a case for the Taj Mahal. For this i cut 5 pieces and then joined them using cellotape. I have given below some close up pictures. Awesome piece of work!!! You are the Shah Jahan of the thermocol world!!! thanks for stopping by.....following you too! Get job !! U r so talented. very creative. must have taken a lot of time for all these minute details..
Is there a way I could get a more detailed way to make it? I love it, you are very good at making it. Could you please provide me with a more detailed procedure on how to make the Taj Mahal? It looks so good that I want to try, but I don't understand exactly know how to do it. You have to first get used to shaping thermocol using the sand paper. Make a small round pillar first and then try making other shapes. As you get used to shaping the thermocol you will get confidence. Then you can go ahead with making this one. Making a taj Mahal even a small one is not easy. It took me nearly 15 days to come up with this.